Bob’s Chowder & BBQ Salmon has been a fixture in the small town of Anacortes, Washington for nine years and one of the Skagit Valley’s iconic seafood restaurants. Whether you live in Anacortes, are in Anacortes for the weekend or visiting from Seattle for a day trip, Bob’s Chowder (as the locals call it) it is one of the best places in town to get fresh and local seafood. I would like to thank Bob’s Chowder & BBQ Salmon for sponsoring this post. Bob’s Chowder & BBQ Salmon is owned by Bob and Barbara Atterberry. Bob is a hearty Anacortian who spent time fishing and working in Pacific Northwest waters. Barbara is a lively New Jersey gal with a love for teaching and the beach. I meet Barbara soon after I moved to Anacortes and over the years our paths have crossed at local events. One Christmas we even entered a gingerbread house competition together. I was thrilled when she invited me to Bob’s Chowder to sample their tasty menu and learn about their restaurant. It began with quite a story. Bob and Barabara Atterberry in Anacortes, Washington. On their wedding night, Bob and Barbara swore to each other that they’d never have a restaurant. Well, as you know, “never say never” tends to have the opposite effect. This happened when their son Ross caught on fire at the age of five and incurred very serious full thickness burns. After his initial hospital stay, his recovery included multiple weekly visits to the hospital and more surgeries. When even more surgeries loomed on the horizon, Bob decided he needed to be closer to home rather than out at sea for months as a Cheif Steward of Alaska Ocean. They purchased Avenue Catering and set up a booth at the Farmers Market. During this time, they started playing with cold pressed oils made from the rinds of fruit and from that Lemon Love Dressing was born. It was so popular, for salads, veggies, salmon and more, that people came to their booth at the Everett Farmers Market and asked to take soup cups of it home. With its popularity, making this dressing available for purchase to the public was a no-brainer. After running Avenue Catering for a few years, they decided to shift to a more permanent locale, and when the space they are currently in became available, they opened Bob’s Chowder & BBQ Salmon. They’ve been at this location for nine years, and over time the original small space has expanded to include an indoor seating area and an outdoor patio. Bob’s Chowder & BBQ Salmon is a mix of their personalities and their connection to their family and the community. There are also photos of Barbara’s family and days on the East Coast, and the cutouts in front of the restaurant, represent Bob’s three children with his first wife, and his two children with Barbara. Decore is both Pacific Northwest, including art by local artist Bill Mitchell, and fun and bright accents that remind one of a restaurant on an East Coast beach boardwalk. Over the years, they have developed three more dressings, Tangerine Tango, Ba Da Bing, and the NEW Cilantro Lime. I’ve tried three of the dressings, and like them all (Lemon and Cilantro Lime are my favs). I’ve yet to try Ba Da Bing (balsamic Bing cherry). I’m sure that is super yummy too, and Barbara told me it is great for pulled pork. They also have a new salmon rub with their unique mix of spices. 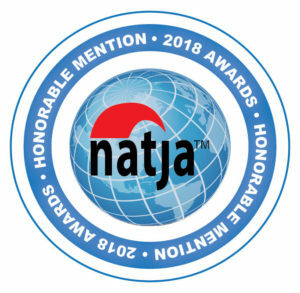 You can find their dressings at Bob’s Chowder, Haggen’s Food Grocery Store, Fred Meyers, The Market, small specialty stores, and you can also purchase online. If you are wondering how to use their dressings at home, their website has over a dozen recipe ideas. Their dressing line is gluten, dairy and sulfite free. My go-to item at Bob’s Chowder is their delicious salmon wrap with lemon love dressing. During this visit, I sampled several menu items, all of which I’d never had before. I started off with Bob’s award-winning New England style clam chowder. Wow! (I had planned to take some of this home to my chowder loving husband and ended eating it all. Oops.) 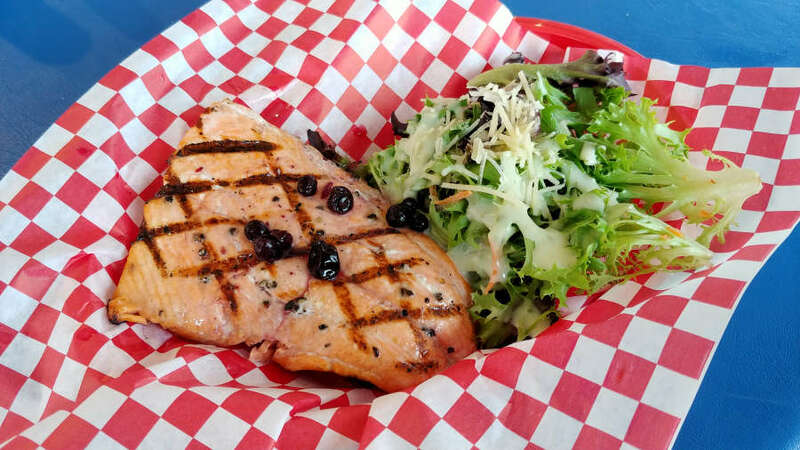 Followed by the grilled wild salmon with huckleberries and a salad with their house made cilantro lime dressing as well as fish n’ chips with Pacific Cod, fried Willapa Bay oysters, and fried prawns. I was too full to try any of their housemade sweets, and when my sweet tooth kicks in, I need to stop by for their popular coconut cake pound cake and key lime pie made with their dressing. In this day and age, people are more conscious of where their food is sourced from. The Atterberry’s pride themselves on using locally caught and harvested seafood, like Pacific caught cod, local salmon that follows the runs, Willapa Bay oysters, and certified and sustainably caught prawns. One seafood item you won’t find at Bob’s Chowder is crab. Why? Bob is allergic! They also make all their own batter, sauces and bake their desserts in-house. Where is Bob’s Chowder & BBQ Salmon? 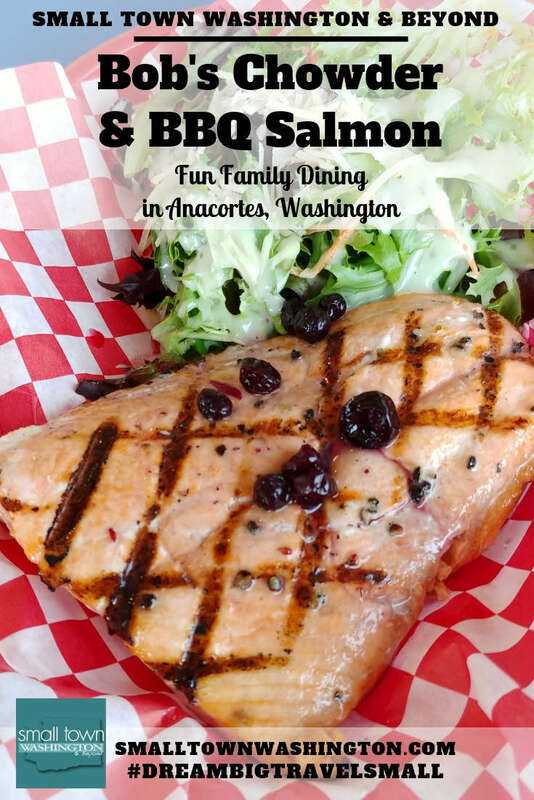 Located on 3320 Commercial Avenue, in Anacortes, Washington Bob’s Chowder & BBQ Salmon is one of the first restaurants you’ll see as you drive into town. With its bright colors, it is hard to miss. They are open daily at 11 am until the tide changes. They also have a location in La Conner, Washington at 512 S. 1st St.
For updates and happenings, follow their Facebook page. Looking for more ideas for a day or weekend getaway? Read about things to do in Anacortes like kayaking, fishing, hiking and more. Travel tip: If you are traveling with a large group, call ahead, and they will reserve tables in their indoor dining room. Travel tip: If you are heading to the Anacortes ferry or coming back from the San Juan Islands, you can call ahead to place your order and pick it up on the way. Have you dined at Bob’s Chowder & BBQ Salmon? What is your favorite dish? 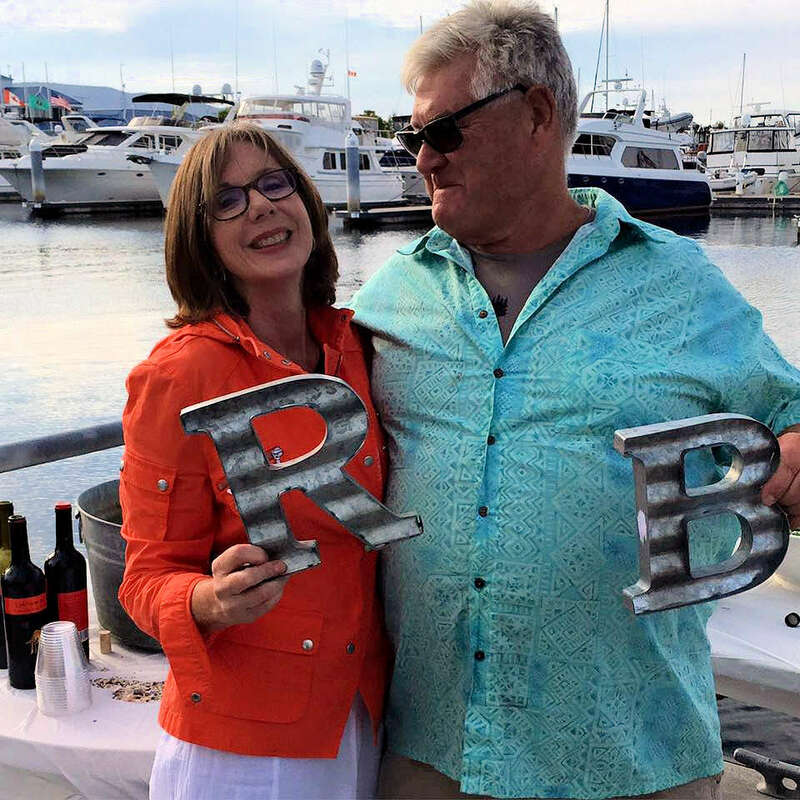 What an incredible and inspirational story of how Bob and Barbara built their business! In addition to their personal story, I’m so impressed with their business practices such as sourcing local seafood. All of the food you photographed looks so delicious! I’d gladly stop in for a chowder, salmon filet, oysters, or fried prawns. Definitely keeping Bob’s Chowder in mind for when I visit Anacortes. Really hoping to make that trip happen soon! Erin, You’d love Bob’s Chowder! I can’t wait until you are back this way! You had me at BBQ Salmon! Everything looks so delicious, I’d really love to try that dressing. Carment, The dressing is amazing!!!! Sliced cabbage and lemon love make for a great healthy afternoon snack. Truly an inspiring story. It is a testament to their passion and drive that even during such personal events they endured. The pics of the food looks absolutely inviting, delicious and I’m hungry. I love the promise they made to eachother on their wedding night. JJ, That promise is pretty ironic. You never know what life will bring you! That salmon looks divine and I bet it is great with the NEW Cilantro Lime sauce. I was in Anacortes to go whale watching so this would make the perfect stop afterwards. Sounds delicious. 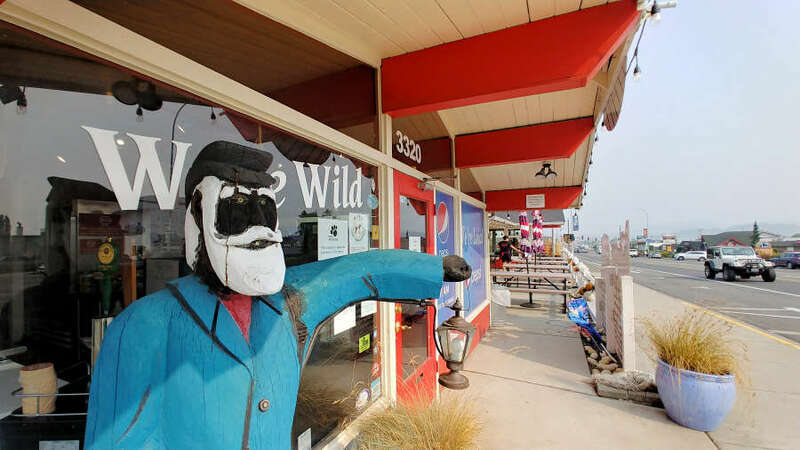 Nicole, This is a great place to head out to the San Juan Islands for whale watching! We did it this summer and they took us up into Canada! Yes, Bob’s Chowder would be the perfect stop after, or before to bring a lunch with you. The story of Bob and Barbara makes for fascinating reading. Though they never planned to have a restaurant, fate seemed to have something else planned for them. Lemon love dressing is another lovely story that had me riveted. Bobs Chowder and BBQ Salmon seem to be a great place for awesome seafood in a place that has such a human touch to it. Sandy, I like that sentiment “a human touch.” I really enjoyed getting to know more about their story and how Bob’s Chowder came to be. Hopefully your travels will take you to Anacortes and you can check it out! This is a stop for certain the next time I’m in Anacortes which is one of my favorite NW towns. How sad that their son had to go through that but it sounds like the family triumphed. I hope their boy is doing well. I’m with you too on the dressings although all sound delicious. Elaine, If you come through Anacortes, let me know, we can meet there for lunch! My mouth is watering. I think the lemon cilantro would be my fave too. It seems like it would be good on a Mexican style salad with corn and black beans. Dana, That sounds really good! We will be back in the Seattle area in August next year. Hope to visit Bob’s and other places you’ve written about! Carol, That’s great! Yes do! What an incredible story. I was so sad to hear about their son’s unfortunate accident, but it sounds like they got through the tough times. The restaurant looks so inviting and the food sounds delicious! Candy, That would certainly be hard to go through, and yes, they established a great and much-loved restaurant. What a great story – – from tragedy to chowder triumph! Bob and Barbara seem like special people, and their food sounds delicious. I would like to try the prawns and get some of the cilantro lime dressing. What a tasty flavour combination! Heather, Salmon and lemon go so well together, also with steelhead. Yum! Bernadette, Ha! Now I’m thinking of their chowder! This place looks absolutely delightful!! There’s nothing like a family-owned seafood place. And I love the background story too! Out of tragedy, they built a life they never expected, and that is so cool. Alos…cocnout pound cake?!? Now I’m drooling. Maggie, It is an inspiring story for sure, and they are both such great people too. Melissa, If you come into town, give me a holla and we can meet up!